The Heart of the City festival ends on a high note at the east-end’s historic Ukrainian Hall with lively music, invigorating dance and colourful costumes at Ukrainian Hall Community Concert & Supper. 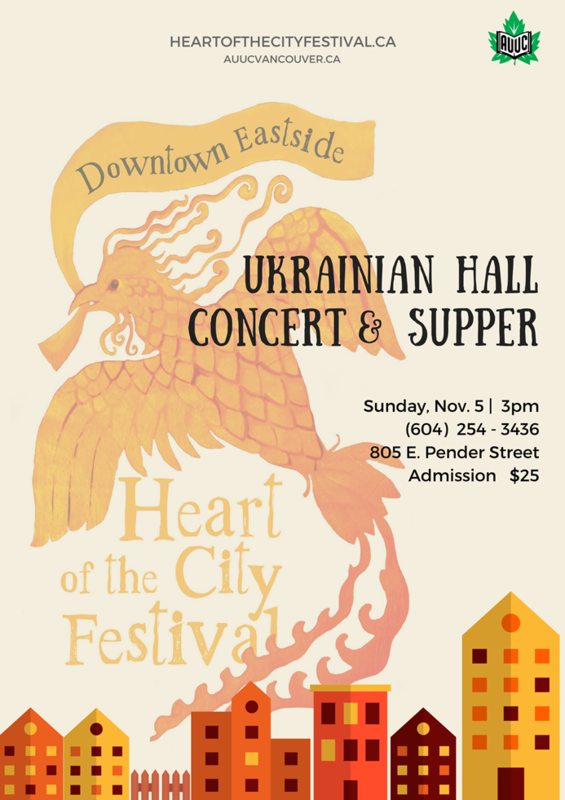 This annual favourite, produced with the Association of United Ukrainian Canadians, features the Barvinok Choir and the award-winning Dovbush Dancers. To celebrate the Festival theme Honouring Women of the Downtown Eastside we have invited special guests: the all-women Japanese drum group Sawagi Taiko; a performance of “Frost Exploding Trees Moon” performed by Michelle Olson of Raven Spirit Dance; the audience favourite “The Perogy Scene” from Vancouver Moving Theatre’s production Bread & Salt; and a multi-media tribute to the women of the Ukrainian Hall created by Tatyana Beck and Libby Griffin. Immediately following the concert is the always-delicious traditional Ukrainian Supper. A full meal and concert deal! Click here to go to the Heart of the City website.